This year tatica and me we are helping to organizate the FLISOL in our city San Cristóbal, on behalf of Fedora project and the our local LUG, we will to have several talks and workshops, to highlight two talks with Fedora members/ambassadors of the Colombia and of course we have Fedora 25 installs with another distros and sharing Software Libre to Windows users. FLISOL is the Festival Latinoamericano de Instalación de Software Libre, is a event that takes place simultaneously in the same day of the April month (usually the last saturday of April) on several cities on Latinoamérica. 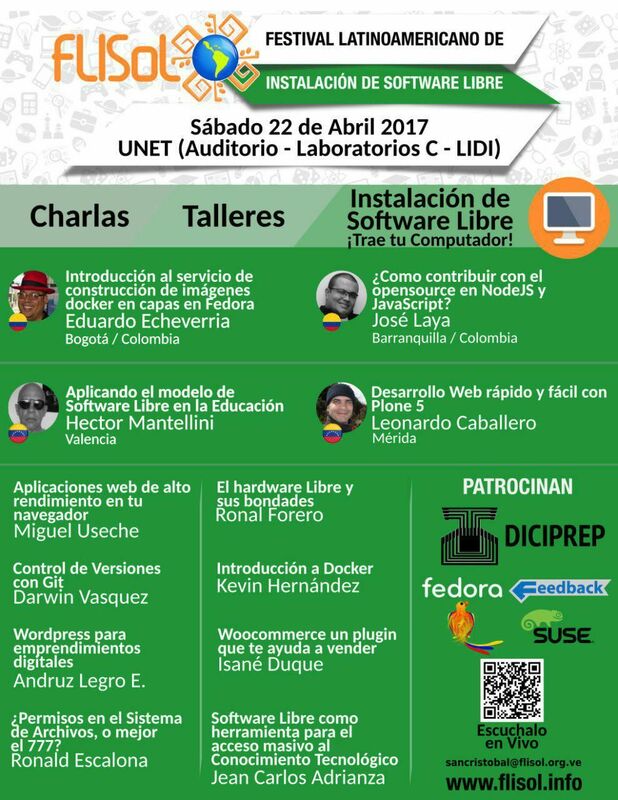 In this time I want to invite you to visit us on this event to sharing about Software Libre, come with your pc or laptop to install some distro and talk about your distro choice. Fedora Project members on Venezuela and another countries, if want to help us on the next year, please contact us.